The cost of auto accidents to the people of Arizona is extensive. According to the Arizona Department of Transportation, in just 2013 alone, the statewide economic cost of car accidents was $2.9 billion. Arizona Maricopa County accounts for the greatest economic losses due to car accidents in the state. Injuries alone cost victims over $700 million, and that not even counting the $500 million families of victims lost due to a loved one fatality. In total, car accidents cost Maricopa county almost $1.7 billion in lost wages, lost productivity, medical expenses, administrative costs, property damage, and employer costs. The estimated cost for each accident was $74,000, with fatalities costing families and loved ones $1.4 million. These figures account for lost productivity and missed time at work, medical fees and expenses, property damage, and other costs related to the accident. Sadly, many victims and their families simply cannot afford these bills on their own. With the median yearly income of a typical American hovering at around $50,000 even the most well-off individuals would have trouble footing the typical kinds of bills and expenses that are incurred following an auto accident. If you’ve been injured in an auto accident in Mesa, Arizona or Phoenix, AZ, you and your family may be suffering from new stressors and challenges. Fortunately, the law affords protections for victims of auto accidents to ensure that families are protected. 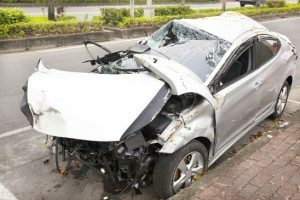 Arizona allows victims to sue parties for negligence following a car accident, and those at fault are required to pay money to victims. Victims can get help from a car accident lawyer or a motorcycle accident attorney to sue for pain and suffering, medical bills, and lost wages. In Arizona, victims can also sue for punitive damages with the help of an auto accident lawyer. While determining the amount owed to victims for medical expenses can be rather easy because there are tangible bills involved, it can be more difficult to determine a clear value for pain and suffering and lost wages, as well as determining whether punitive damages should be sought. If you’ve been injured and are considering taking your case to court, a skilled auto accident lawyer in Mesa, Arizona can review all relevant facts of your case and determine a reasonable value for your accident. A car accident lawyer will also be familiar with the local laws in Mesa, AZ and Phoenix, AZ. Raymond Arenofsky, Attorney at Law, has been serving and protecting car accident victims in Arizona for 50 years. If you or a loved one has suffered an incident in Mesa, AZ or Phoenix, AZ, contact the firm today for a free, initial consultation. Many car accident victims want to know how much their case is worth. There are many complex factors that go into making a determination of the value of a given personal injury case and each case will be unique. Arizona is a pure comparative fault state, meaning that victims can recover damages from the at-fault party up to the percentage of responsibility attributed to the other party. This means that if the driver of the other car that hit you is found to be 60% at fault, you’ll be entitled to recover 60% of the total damages. Because Arizona is a pure comparative fault state, you are entitled to recover damages even if the other party is found to be even 1% at fault. In this case, you would only receive 1% of damages, but in some cases where injuries are extensive, it makes sense for victims to sue. In order to do that, they will need to get help from a car accident lawyer, a motorcycle accident attorney, or an auto accident lawyer in Phoenix, Arizona. Determining fault is a complex matter, and your auto accident attorney will have to carefully review police reports, the circumstances surrounding and leading up to the accident, and may even need to interview witnesses to get first-hand accounts of driver behavior and actions. Once fault has been determined, your lawyer will also need to evaluate the pain, discomfort, suffering, disfigurement, anxiety, and disability a victim has suffered. These factors go into determining the value of a pain and suffering claim. For instance, a victim who suffers from a permanent, life-altering disability or disfigurement following a car accident will be liable to collect more money than a person who suffered a broken bone. Yet, even fractures cause discomfort, suffering, anxiety, and temporary or permanent disabilities, and only a skilled car accident attorney can determine the proper value of pain and suffering. For instance, a top-notch athlete who loses a sports scholarship due to a broken leg in a car accident will likely receive a greater reimbursement than a person who works in a sedentary industry where he or she could continue working despite the injury. Punitive damages are damages sought above and beyond pain and suffering, wage loss, and medical expense claims. These damages are meant to punish the negligent party for their actions. Punitive damages require a greater burden of proof. An auto injury lawyer is required to show that the other driver either intended to cause injury, acted out of ill-will, or had reason to know that his or her action posed a great risk to others. If you were injured in an incident involving a driver engaging in road rage, reckless driving, or if you were the victim of a drunk driver, you may be entitled to punitive damages. Get in touch with an experienced personal injury lawyer in Phoenix, AZ, or Mesa, Arizona immediately. When it comes to determining damages, experience counts. Raymond Arenofsky, Attorney at Law has 50 years of experience helping victims and their families calculate personal injury damages. If you’ve been in an accident, you need a car accident lawyer in Mesa, Arizona who can defend your best interests and ensure that you receive the maximum compensation allowable under the law. Raymond Arenofsky, Attorney at Law understands the unique challenges victims of car accidents face. If you’ve been injured in a car accident, information is your best weapon and defense. In order to help you to this end, Raymond Arenofsky, Attorney at Law provides a free, initial consultation to car accident victims. Knowledge is power. If you need expertise about how to move forward, Mr. Arenofsky can offer you free assessment of your case. The Arizona Department of Transportation reports that in 2013 alone there were over 3,000 motorcycle accident crashes in the state. 79% of these accidents (over 2,000) resulted in injury. Many of these accidents occur because the motorcyclist collided with another vehicle. Sadly, in the vast majority of accidents, the motorcycle operators were alert, and not under the influence of drugs or alcohol. 84% of cyclists involved in car accidents were found to be sober, not taking medications, or fatigued. In almost 50% of accidents involving cyclists (46.86%), the operator was found to not be at fault for the accident, meaning the rider did not break any laws regarding speeding, yielding right of way, following closely, disregarding signs or signals, or making unsafe lane changes. The reality of the situation is that in many accidents, the rider was following the rules of the road and taking every precaution to keep himself or herself safe. Tragically, when cars collide with motorcycles, the person who is more likely to suffer serious injuries is the cyclist. Without a car protective chassis to protect them, motorcycle riders are more likely to suffer serious or debilitating injuries. If you’ve been the victim of an accident, you may be facing a long recovery period or lifestyle changes. Serious injuries can lead to missed time at work and can result in high bills. Most families struggle in the aftermath of any car accident. Accidents are unique in that they are more likely to result in costly injuries. If you have been a victim of an accident, or if you have lost a loved one due to a motorcycle accident, this may be one of the most difficult times of your life. You must get in touch with a motorcycle accident lawyer in Arizona right away. Raymond Arenofsky, Attorney at Law understands the unique challenges faced by victims and families of motorcycle accidents. The firm stands by its clients to help them seek compensation for their injuries and to ensure that careless drivers are brought to justice. In personal injury cases, experience matters. One of the main factors that families look for when selecting an attorney is the level of experience held by the lawyer. Raymond Arenofsky, Attorney at Law has 50 years of experience serving as a personal injury attorney. He has represented clients all over Arizona in all kinds of motorcycle accident cases and auto accident cases. According to a report published by the National Highway Traffic Safety Administration, lower extremity (leg injuries) were the most common motorcycle injury sustained by victims, with bone fractures being among the most common kind of motorcycle injury. The study also found that when victims sustained chest and abdominal injuries, these injuries tended to be severe. Yet, even a leg fracture can come with a heavy price tag. The study found that even just one lower extremity injury resulted in a $21,000 hospital visit. Victims who sustained a combination of injuries in addition to lower-extremity injuries, often were left with medical bills in excess of $50,000. While many individuals had health insurance, 1 in 5 individuals were uninsured and had to pay these bills out of pocket. For middle class Americans, a $50,000 hospital bill would account for a year worth of pay, or more. The median U.S. income is $51,000. Fortunately, an injury attorney in Mesa, Arizona can review your medical history, determine the extent of your injuries, and help ensure that the responsible parties pay for your medical bills. Other common injuries sustained by injury victims include, internal injuries, road rash, traumatic brain injury, and paralysis. Each of these injuries can require extensive treatment. For instance, internal bleeding can cause bleeding that can kill a victim within minutes or hours, if not treated. Internal bleeding sometimes requires surgery to properly treat. In all these cases, it is imperative to get legal help from a personal injury attorney. If you’ve suffered from any of these symptoms following an incident, you may be suffering from mild traumatic brain injury. Because many people are not diagnosed with mild traumatic brain injury, you may need to be evaluated by a doctor if you’ve begun to experience these symptoms in the weeks and months following your accident. Raymond Arenofsky, Attorney at Law has the experience to ensure that you receive proper medical treatment for the full extent of your injuries. The firm will fight to reimburse you, not only for medical expenses, but also for your pain and suffering which you may have incurred as a result of being in an auto accident or motorcycle accident. Between the years of 1997 and 2006, there was an increase in the number of motorcycle incidents. As cycle riding has become more and more popular, accidents are more likely to occur. Raymond Arenofsky, Attorney at Law is a injury lawyer in Mesa, Arizona who will take the time to learn about your case, and who will fight aggressively to ensure that you receive compensation for medical bills, lost wages, and pain and suffering. The firm doesn’t rest until you and your family wins. Contact the firm today for free, consultation at (480) 345-0444. Our experienced and qualified car accident lawyer and motorcycle accident attorney can be of assistance.